Conant Smith shown putting the finishing touches on his State Championship victory. For the track fans out there who were not already aware, news broke recently that one of Ohio's top distance runners, Conant Smith, will unfortunately not be able to compete during his senior season due to injury. The Middletown representative has suffered a navicular stress fracture in his left foot, which requires a cast for several weeks and then a dedicated rehabilitation process. 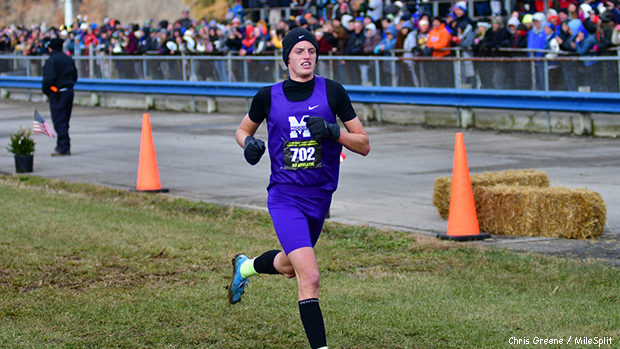 Smith had a remarkable high school career, highlighted by his Division 1 XC State Championship win this past November, his eighth place finish at Nike Cross Nationals in 2017 and a personal best 5k clocking of 14:56.10. Following his 2018 cross country campaign, he was named Ohio's Gatorade Athlete of the Year. On the track, Smith claimed top 8 finishes in the 3200 at the last two OHSAA D1 State Meets. His distance resume includes stellar pr's of 1:56.04, 4:12.90 and 9:14.04. 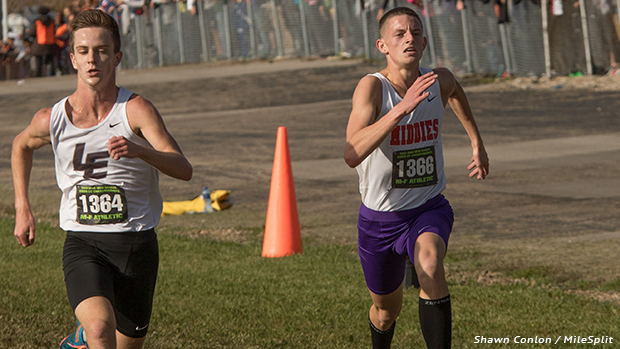 Conant was gracious enough to afford MileSplit some time to talk about his injury, the rehab process, his fondest memories about being a Middie athlete and his future goals. What is the injury that you have and what is the timeline for your recovery? "The injury that I have been diagnosed with is a navicular stress fracture in my left foot. The navicular bone unfortunately is a slow healing bone and my recovery is rest (immobilization) which allows the bone to completely heal." Looking back at your high school career, in both cross country and track, what are some of the accomplishments that you're the most proud of? "Looking back at my high school career I have a few accomplishments that I am most proud of. For one, winning the 2018 State Championship. I'm most proud of this because my coach and I had planned and made winning the state meet a goal for 5 years. It was awesome winning because the goal finally became a reality. A few others close behind are running in the 2017 Nike Cross Nationals and being an All-American. Also, I'm very proud of running a solo 14:56 at our conference meet." What were some of your toughest races, favorite meets and favorite courses? "When talking about my toughest race throughout my high school career, the first race to pop into my head was NXN. The course conditions and competition made that race the toughest. My favorite meet was Centerville Saturday Night Lights - it's alway fast and there's just something awesome about running late at night under the lights. There is always an incredible atmosphere there. My favorite course is definitely the Mason Invitational. This course is the best because of the hay bales, the creek crossings and all the mud. When I think about real cross country, that's the first race I think of." Who was the toughest athlete that you competed against during your high school career? "The toughest athlete I competed against was hands-down, Dustin Horter. He brought his best every meet and never made things easy for the rest of us. I learned a lot from him as an athlete. I raced against him far too many times to not give him all the props for being the toughest athlete I've lined-up against." Dustin Horter and Conant Smith had an epic battle to the line at the 2017 D1 State Meet. What was best thing about representing the Middletown Middies over the past four years? "The best thing about representing the Middletown Middies over the past four years is following in the footsteps of former Middie greats, such as Jeff See, my coach David Fultz and Micheal Veatch, just to name a few. I also enjoyed building relationships with my teammates and coaches. Without them my experience would not have been as fulfilling as it has been." What goals do you hope to achieve at the college level for Arizona State? "The goals that I have at ASU are to make an impact and contribute to the team's success. I would like to earn All-Pac 12 in XC and track. I also hope to make NCAA's and be an All-American and of course to win a national title would be great." What advice would you give to a young athlete who wants to maximize their potential at the high school level in cross country and track? "A few pieces of advice I would give an athlete who looks to maximize their potential in cross country and track is always listen to what your coach says, listen to your body and make sure to keep easy days easy and hard days hard."